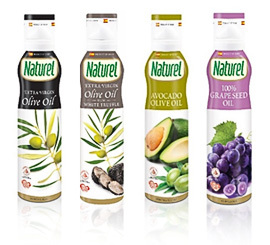 Naturel spray oils are trans fat free and low in calories (1 spray < 9kcal). Infused with a touch of fig leaves for a sweet smooth taste with gentle hints of spiciness. Ideal as a dip or for salad dressing. The best olives from Spain, combined with white truffles extract gives you an earthy gastronomic perfection with gentle hints of spiciness. Using the best olives from Spain, combined with the finest tropical avocados gives a full-bodied flavour with gentle hints of spiciness. Ideal for grilling, baking or BBQ. Extracted from the seeds of the grapes, Naturel 100% Grapeseed oil is light in colour and has a mild nutty flavour. Ideal for frying. Our unique triple spray system allows you to smoothly distribute and control the amount of oil desired.